The Burdur Lake basin in Turkeys Mediterranean region has been facing severe environmental damage in the form of increased pollution and a decrease in water volume, despite its Ramsar status as a major wintering site for the endangered white-headed duck (Oxyura leucocephala). While the Lake is among Turkeys 13 internationally important wetlands and one of the key Biodiversity areas, it has lost one third of its area since 1975 and its water level has dropped to 12.25 m. During this time, the surface area also dropped from 228 km2 to 153 km2. Even though since 1995 a rainy period has reigned in Burdur Lake Basin, the speedy drying out of the lake reveals the anthropogenic source of the problem. The main reason for water level drop is dams and reservoir lakes that have been constructed on streams and rivers feeding the lake since 1970. Likewise a vast number of wells drilled around the lake cause the depletion of groundwater feeding it. On the other hand, water used in irrigation gets wasted when efficient methods such as drip irrigation are not applied. If the situation continues as such, an important part of the lake will be dried out by 2040. Province Greater part of the lake is situated in Burdur province while the rest is in Isparta province. Project Details There are 14 dams and dam lakes on Bozcay, the biggest river feeding Burdur Lake. 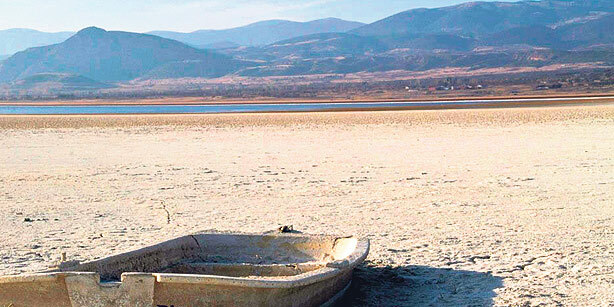 With the completion of Karacal Dams construction and consequent water retention a few years ago, there is no more water reaching Burdur Lake from Bozcay. A great number of wells drilled around the lake also cause the depletion of groundwater feeding it. It is estimated that 42 hm3 water is being extracted only from licensed wells of the basin. The magnitude of the water extraction from wells can be understood considering in addition the illegal groundwater wells. In Burdur Lake Basin, 126hm3 water is being held in dams and dam lakes constructed over watercourses feeding the lake and 72,4 hm3 of this is being channeled to agricultural fields. With the start of Karacal Dams retention over Bozcay, the total held water amount has increased to 202 hm3. Works have been initiated for the construction of 11 new artificial lakes in Burdur Lake Basin. Potential Affected Population The population of Isparta, equal to 411,215. Environmental justice organisations and other supporters For the protection of Burdur Lake, the Nature Association (Doga Dernegi) cooperated with many other groups. In fact, together with some professional/trade associations in Burdur, NGOs working in different fields such as environment, womens issues, sports etc. act together to save the lake under the so called Rescue Crew for Burdur Lake in accordance with Nature Associations Saving Burdur Lake Project objectives and activities. Other In the dried-out part of the lake, the dust raised due to wind erosion potentially increases the risk of respiratory illnesses. Other Loss of income, difficulties in accessing water, and migration from rural to urban areas and from Burdur to different cities, which can be voluntary or enforced. -Broadening the scope of the Burdur Lake Management Plan in such a way that more water from the basin enters the lake and that it covers all activities influencing the lake; and ensuring its implementation. -Ensuring that watercourses feeding the lake actually reach the lake and reducing the negative impacts of wells. -Spreading the use of less water intensive plants and irrigation methods in the basin. -Reviving the lake culture around Burdur Lake. In the past years, as part of Saving Burdur Lake Project, 3 pilot drip irrigation zones have been set up in two villages and a neighbourhood of the city center. In conjuction with the Provincial Directorate of Food, Agriculture and Animal Husbandry, drip irrigation trainings have been given to 1524 farmers in 41 villages. In 2012, it is targeted to set up 2 new pilot zones for growing water efficient agricultural plants. Why? Explain briefly. Public awareness was raised about the problems related to the drying of the lake in terms of Burdur community, culture and biodiversity at public at large. In this sense, there is perhaps a partial success from an environmental justice perspective. However, drainage/drying of the lake has not yet been stopped. General public policy regarding wetlands: With the idea of not letting water flow to waste, the general political approach, especially of the General Directorate of State Hydraulic Works (DSI in Turkish acronym), is to maximize the utility of each wetland by building the highest possible numbers of dams and artificial lakes on them for irrigation or power generation instead of evaluating wetlands in and of themselves for their place in the natural cycle and their services. Risks such as the extinction of species using the wetland habitats, decrease in revenues from agriculture and animal husbandry in the region due to changes in the microclimate, potential wind erosion in the drained zones are being ruled out as a result of the wetlands drying out from this short-term policy. By-law on Conservation of Wetlands (2005). In 2010, some clauses of this by-law have been revised in the framework of the below explained policy. Nature Association has filed a case for the cancellation of the revision due to its contradiction with Ramsar Convention. Ataol, Murat. Proposal for a New Water Management Model for Burdur Lake Basin. Doctorate thesis, Ankara University, 2010. Adaman, F., Hakyemez, S. and Ozkaynak, B. The Political Ecology of a Ramsar Conservation Failure: The Case of Burdur Lake, Turkey, Environment and Planning B, 27 (5), 783 800. 2009.